A nuclear weapon which generates the largest portion of its enormous energy through fusion reactions (the merger of forms of hydrogen atoms to produce helium atoms). The other form of nuclear weapon is the fission bomb in which energy is released through a chain reaction of splitting uranium or plutonium atoms. Fission bombs are used to trigger hydrogen bombs. “A hydrogen bomb is a weapon which in practical effect is almost one of genocide.” —Enrico Fermi, Nobel Prize winning physicist, quoted in Scientific American, Nov. 2000, p. 109. [However, it should also be noted that Fermi himself was on other occasions guilty of promoting genocide, as with his 1943 proposal to use radiological weapons to poison food supplies in Germany and kill as many Germans as possible. —Ed. A founder and leader of the Social-Democratic Federation in Britain and later one of the founders of the British Socialist Party. Hyndman was always one of the leaders of the Right wing of the socialist movement in Britain and a complete opportunist. In 1916 he was expelled from the BSP for putting out propaganda in support of the imperialist war. He was also hostile to the October Revolution in Russia and supported imperialist intervention by the West against Soviet Russia. “Although Hyndman was a talented writer and public speaker, many members of the SDF questioned his leadership qualities. He was extremely authoritarian and tried to restrict internal debate about party policy. At an SDF meeting on 27 December 1884, the executive voted by a majority of two (10-8), that it had no confidence in Hyndman. When he refused to resign, some members, including William Morris and Eleanor Marx, left the party. “In the 1885 General Election, Hyndman and Henry Hyde Champion, without consulting their colleagues, accepted £340 from the Tories to run parliamentary candidates in Hampstead and Kensington, the objective being to split the Liberal vote and therefore enabling the Conservative candidate to win. This ploy failed, and the two SDF’s candidates won only a total of 59 votes. The story leaked out, and the political reputation of both men suffered from the idea that they were willing to accept ‘Tory Gold’.” —From the Wikipedia article on Hyndman (as of Feb. 28, 2010). Very rapid and “uncontrollable” inflation. Of course inflation is always really controllable; the government just needs to stop the printing presses pouring out so much new currency. But this might in turn lead to the complete collapse of the government because of its inability to pay its bills, which is why they are reluctant to do so in these circumstances. 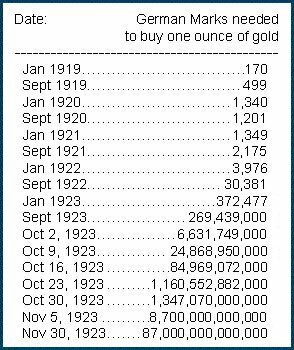 Three of the worst cases of hyperinflation in world history were in Weimar Germany in 1922-23 (see chart at the right); in Chiang Kai-shek’s corrupt regime in China during and after World War II; and in recent decades in Zimbabwe. Hypocrisy is the feigning to be what one is not, or to believe what one really does not, especially with regard to morality and politics. Although there may be individual hypocrites within any political trend, this is especially widespread within bourgeois ruling class circles. The reason for this is simple: Those who oppose the interests of the people must of necessity constantly pretend to promote those interests in order to maintain their privileged position. In addition to this, the requirements of those publicly promoting reactionary ideology often demand that they take positions which even they as individuals do not really agree with. The bourgeoisie is hypocritical in their very essence. “Affair sinks congressman: Republican congressman Tim Murphy of Pennsylvania announced Wednesday that he would not run for a ninth term [and a day later announced his resignation from Congress], amid tawdry revelations of an extramarital affair in which the antiabortion lawmaker urged his mistress to get an abortion when he thought she was pregnant. Murphy said in a brief statement through his office that he will ‘take personal time to seek help as my family and I continue to work through our personal difficulties.’ Murphy’s decision came a day after the Pittsburgh Post-Gazette published text messages between Murphy and Shannon Edwards. A text message from Edwards told the congressman he had ‘zero issue posting your pro-life stance all over the place when you had no issue asking me to abort our unborn child just last week when we thought that was one of the options.’” —News of the Day item, San Francisco Chronicle, Oct. 5, 2017, p. A5. [As used in science:] A tentative assumption made in order to draw out and test its logical or empirical consequences. [Merriam Webster’s Collegiate Dictionary, 10th ed.] Quite often competing hypotheses are developed, only one of which will eventually be proven correct or at least become the generally accepted theory explaining the phenomena in question. “HYPOTHESIS, THEORY, LAW mean a formula derived by inference from scientific data that explains a principle operating in nature. HYPOTHESIS implies insufficient evidence to provide more than a tentative explanation [a hypothesis explaining the extinction of the dinosaurs]. THEORY implies a greater range of evidence and greater likelihood of truth [the theory of evolution]. LAW implies a statement of order and relation in nature that has been found to be invariable under the same conditions [the law of gravitation].” —From the entry for HYPOTHESIS in Merriam Webster’s Collegiate Dictionary, 10th ed. “The form of development of natural science, in so far as it thinks, is the hypothesis. A new fact is observed which makes impossible the previous method of explaining the facts belonging to the same group. From this moment onwards new methods of explanation are required – at first based on only a limited number of facts and observations. Further observational material weeds out these hypotheses, doing away with some and correcting others, until finally the law is established in a pure form. If one should wait until the material for a law was in a pure form, it would mean suspending the process of thought in investigation until then and, if only for this, reason, the law would never come into being. [As used in recent bourgeois economics:] The lingering effects of a recession which continue to retard economic growth years after the recession is officially deemed to be over. As bourgeois economists define recessions, they are “over” when production (GDP) starts to increase again, even if the rate of increase is very slow, and even if production still has not reached the level that existed before the recession began! However, this is being called “hysteresis” only when over a longer multi-year period the rate of GDP growth still does not fully recover and remains significantly lower than the rate of growth before the recession began. In particular, the term is being used in the aftermath of the Great Recession which is officially dated from December 2007 to the summer of 2009. For bourgeois economists, economic growth since then has been puzzlingly sluggish and they are struggling to understand why that is. They invoke the unscientific concept of “potential output” under capitalism, comparing what rates of growth actually are to what they imagine they “should be” or “would be” if the crisis had not arisen. Standard bourgeois theory has no good explanation for this hysteresis or lingering retardation of the capitalist economy, hence all the scratching of heads that is now going on. However, the answer is actually rather obvious from the Marxist standpoint: the overproduction crisis is simply not truly over. According to Marx, capitalist economic crises are resolved by the development of new markets (where that is possible) or else through the destruction of the great excess of productive capital which has accumulated since the previous crisis. If those things cannot be done, or at least not fully done, then the crisis will continue indefinitely, at one level or another. “Many macroeconomics textbooks describe recessions as temporary declines in aggregate demand, when actual output drops below potential output, followed by a recovery period when output returns to potential. However, a number of studies of deep recessions around the world find that recessions have highly persistent effects on output. These effects, sometimes labeled ‘hysteresis,’ could arise because a recession reduces capital accumulation, scars workers who lose their jobs, and disrupts the economic activities that produce technological progress.